This is Part 3 of the Employee Engagement series on addressing the root cause issues that can be addressed to improve engagement in your organization. Read Part 1 here. Read Part 2 here. 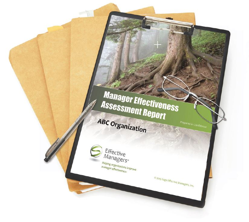 Effective ManagersTM has designed an survey-based assessment approach to measure the current state of your management effectiveness. The results are consolidated and analyzed to provide precise recommendations that you can use to adapt its managerial support programs going forward. 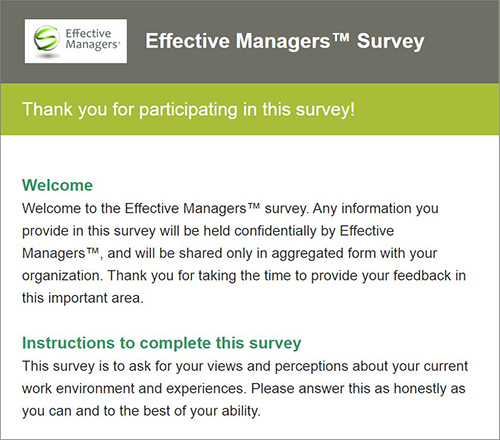 The Survey will be administered to every manager in the organization. Other non-manager individuals may also be included if their specialized knowledge or tenure with the organization warrants their inclusion. The survey is web-based. Users can log on and create an account so that they need not complete the survey in one sitting. Data is saved as it is entered, so if a respondent is interrupted or accidentally exits the survey, no data is lost. Respondents are assured of confidentiality, and results are presented to you only in a consolidated way so individual responses cannot be identified. The specific responses of any one manager are not reported. The survey contains 94 questions in 9 sections. It takes from 20 – 30 minutes to complete. 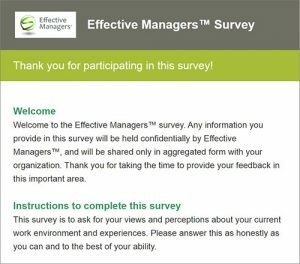 These questions include demographic data, an open text box to gather additional information from managers, and the questions that address the key indicators in manager effectiveness. A series of seven indicators are correlated with Accountability in organizations. These are important to understand, as they provide the insight into root causes that can constrain or improve accountability in the workplace. Workflow – The extent to which managers perceive work flowing smoothly across the organization. Organizational Learning – The extent to which individuals in the organization learn from others, share, experiment and transfer knowledge. Role Conflict -The degree of conflict that managers experience in their day to day work. Corporate Systems – Providing support to managers for doing their work. Manager’s Manager Capability – The extent to which managers feel that their manager is capable. Team and Organizational Effectiveness – The effectiveness of both teams and the organization as a whole. Interdependence – How much managers depend on other managers in parts of the organization to do their work. The report includes an effectiveness analysis. The results of each indicator are presented, together with a discussion of the importance of the indicator and how it would apply to your situation. The report also includes a high-level summary overview of the indicators, specific observations of organization strengths on which to build, and specific opportunities for improvement. If the Gold Level of service is selected, the information from the interviews of the CEO and his or her subordinates will also inform the analysis. The analysis is documented in a report, and recommendations for action are prepared. The report is submitted to the CEO and the Executive Management Team for review in advance of the meeting. The report can be used freely within your organization.